You'd think after running for 8 years I'd get the hang of these things. Aparently not. Yesterday I ran a 5K with a friend of mine. After an initial mixup (I didn't know the area and mistakenly tried to enter a rowing race instead of the running race), things kicked off pretty well. I thought I'd share with you some of my post-race thoughts. 1. 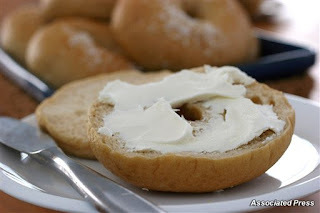 I probably didn’t need to eat a bagel smothered in cream cheese before the 5K, considering you only burn about 100 calories a mile. I’m pretty darn sure the bagel was (a lot) more than 300 calories. 2. Don’t run with tall people. They’re legs are longer, so they’re cheating the whole time. 3. If they say the race course only has one hill, they’re lying. It has at least 5. 4. A 5K is not 3 miles. It’s 3.125 miles. So you’re not done when you hit the 3-mile marker. And that last 0.125 miles will be a pain in the bum. Why do we even have races in kilometers? We’re not in Canada. 5. Old men are fast. Don’t underestimate them or get in their way. They will cut you. 6. As a general rule, you should not run 9 miles the day before your 5K. Your legs will hate you. And you need them on your side come race day. 7. Why is it a prerequisite that all race t-shirts must be size XL, ugly and cotton? Why can’t they have some soft women’s cut, v-neck Ts? Something a bit flashy and sassy. 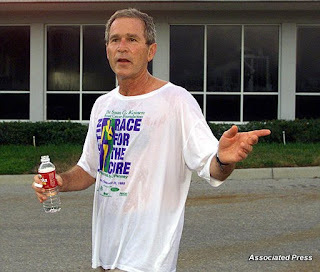 I mean, even a president can’t pull this off. Have you run a road race recently? What've been your take-aways? This entry was posted by kate, on Monday, April 26, 2010. You can leave your response .